You are currently browsing the tag archive for the ‘brain fog’ tag. The past few weeks have found me in a bit of a fog as I deal with the uncertainty around my health. I just can’t seem to concentrate or retain information very well no matter how hard I try. My visit with the surgeon last week didn’t do much to alleviate my brain fog. Even the little information he was willing to commit to was a bit fuzzy around the edges. “Two masses that look like one… Moderately suspicious with elevated risk factors.” There was some peace of mind to be found though. I am scheduled for biopsies this week and should have answers early next week. That’s good concrete information for now. The good news is you, my faithful readers, will be the benefactors of my brain fog. I found myself waiting for my husband to return a rental car on a very busy Saturday morning after his first week on his new job. As time dragged on, I pulled out my portable Zentangle kit (really a portable hard drive case from Office Depot) and started a new tile. Once I finished the string of pearls, I wanted to try the tangle Leaflet by Helen Williams. I had watched her video last week for how to draw the tangle and thought I had it down. Ah, not so, not so. The brain fog you see. 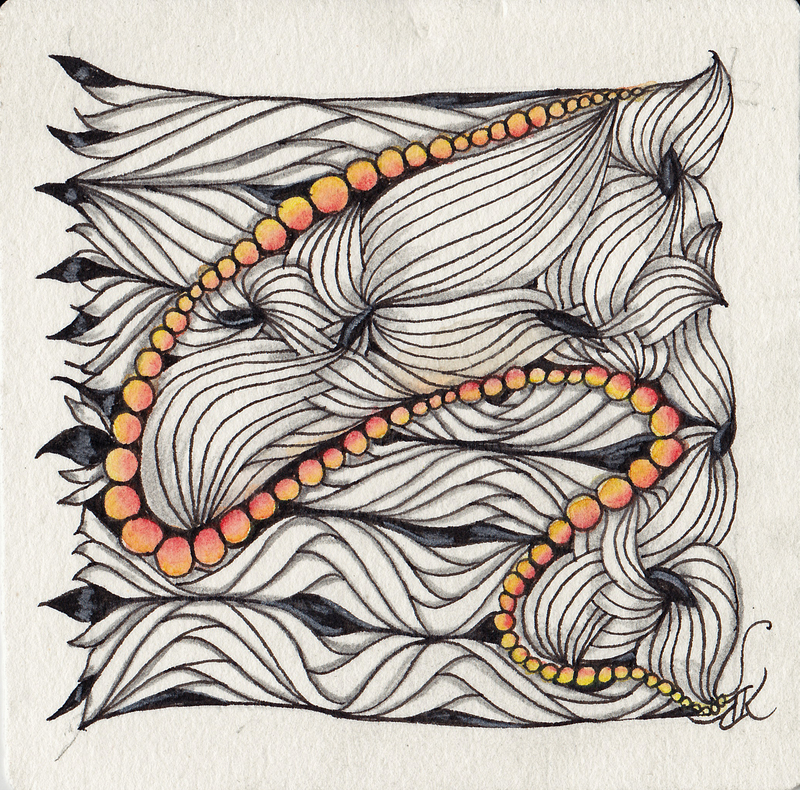 I realized pretty quickly things were not progressing as they should, but in true Zentangle style, I just kept going. In the end, I like what emerged and I think it may very well be a new tangle. In that spirit, I recorded the step-outs to share with you. 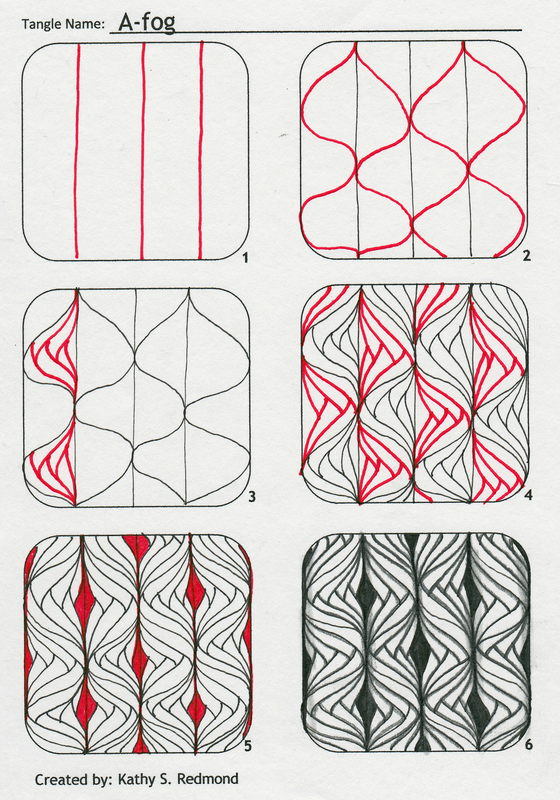 This is a tangle that looks better if it is a little “wonky.” Spacing can vary and the curved lines in step 2 do not have to match – don’t you love one like that? A little bit of Leaflet, a dash of Betweed and a whole lot of my brain fog went into this one. I call it A-fog. I hope you enjoy and I would love to see what you do with this one.